The most iconic graphic novel. The graphic novel was a medium that I'd largely ignored up until recently. I was under the absurd assumption that comics were for kids, and that I'd moved on from them years before. God was I missing out. Even before the build up to last years movie I was aware of Watchmen, I'd buy SFX magazine and see the graphic novel being referenced all the time, written about in reverential terms in a sycophantic way that made me want to avoid it at all costs. But as momentum grew, before the release of the movie, I started to pay more attention, got sucked in by the hype and bought the book. What happened next was a revelation. Alan Moore's story, of an ageing group of Superheroes in an America where Nixon is still President and the Cold War is still on, is as engaging as anything I've ever read. The characters feel real, with only one of them having any genuine super powers. It's a murder mystery that spins off on weird tangents, sometimes dropping into a text based style to tell of moments from the past, in others jumping to a story that a minor character is reading in another comic book. There's just so much going on throughout. Of course the weird tangents are really about adding depth and allegory to the story and they work brilliantly, giving it more layers and substance. This is not your cliché laden superhero story, none of the characters are recognisable heroes, however, they have elements of well known heroes from other comics which helps the reader to identify with them. The themes are adult throughout, it's not a kids story by any stretch and the film did well to convey some of that. The art work, by Dave Gibbons, is consistently brilliant and although very traditional it suits the time frame that the story is set in perfectly. So why is it iconic? Well along with the Dark Knight Returns it set a new benchmark for comics. It showed that there was a big audience for stories that had more than just brash characters and an ever changing Universe of heroes. Here was a proper story that blended satire and SciFi into a heady mix. Moore created something unique, there's nothing else out there quite like Watchmen. Do I own other graphic novels as a result of buying it? Yes. Have I enjoyed any of them as much? No. 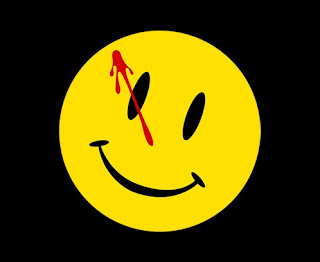 If you've never read a comic book and would never normally consider it, read Watchmen. Honestly, you won't regret it. 'To paint comic books as childish and illiterate is lazy. A lot of comic books are very litterate - unlike most films.' - Alan Moore. Tonight's post is dedicated to (from twitter) @SuperROB, @SoulIsTheGoal, @brotherbenji, @formulaic666, @sn00pyj, @fatmanslimming, @ObiOrion, @maverick99sback (and from facebook), Toby, Kate and Mini. Special mention to @lmlc and @Giusep03 who both suggested the Bayeux Tapestry, which I thought was a genius idea. A fantastic review of a genuinly iconic event, and as you say, along with Miller's DKR (which effectively re-ignited the Batman movie franchise with Burton's first film)it gave creedance to a medium that was just beginning to thrive. The X-Men of Claremont and Byrne and George Perez's work with the Teen Titans had pumped some colour into the Bronze Age, but only with these 2 books did the genre really catch a wider imagination.